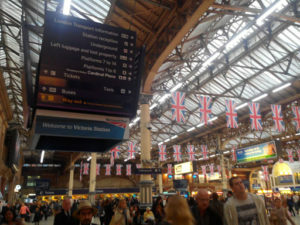 The Victoria station in London is a railway station. 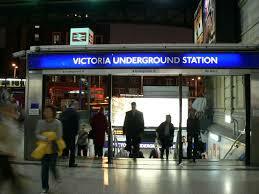 It is also known as London Victoria and it is a central London railway terminus and London Underground station. The station is towards the south of the Buckingham Palace. 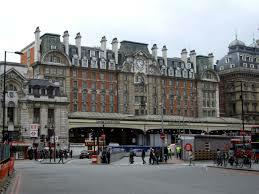 The Victoria station was built to solve the problem of railways of England during the 19th century. The station got its name from a close by Victoria street. It is formed by combining two 19th century stations of London Brighton and South Coast Railway and the London Chatham and Dover Railway. The Victoria station is used by a large number of people every day making it the second busiest station not only in the London city but also in the country. The station also comprises of an air terminal. In 1859, Southern Railways of England, the Great Western Railway, the London and North Western Railway and East Kent Railway come together and formed the Victoria Station and Pamlico Railway. The purpose was to extend the existing railway from Stewarts Lane Junction, Battersea across the river to a convenient location near West End. The London Brighton and the South Coast Railway portion of the Victoria station opened in 1860. This side of the station comprised of six platforms and ten tracks with an entrance that leads to the Victoria Street. It also ran its rail services from Victoria to London Bridge and even the South London line. In 1881, the first all-Pullman train was introduced in the UK. This train provided service from Victoria to Brighton. In 1908 another all-Pullman train was introduced under the name of the Southern Belle. In 1909, over-head electric trains started running into the Victoria station. These trains were on the line of London bridge. In 1911, even the line to Crystal Palace was electrified. In 1923, the two stations at Victoria were clubbed with the formation of the Southern Railway. The most famous trains like the Golden Arrow and Night Ferry were introduced by Southern Railway into the Victoria station. The Victoria station was even had a news cinema for its travelers. This program was started in 1933 and continued to do so till 1981. The station was partially destroyed during the Second World War. In the 1920’s and 1930’s, a major change to the station was in the form of third rail electrification. This system had substituted the original overhead scheme. The South-eastern provides for services on the Chatham Main Line. It even operates at South East London, Kent, The South East Coast, The Medway Towns, London Charing Cross, London Cannon Street, London Bridge and London Blackfriars. The Gatwick Express operated by Southern Railway at Victoria provides a shuttle-style service between Victoria station and Gatwick Airport. Electrically run trains were started in 1925 and service was provided to Orrington. The Brighton Belle was the first electric all-Pullman service in the world. It started its services from Victoria in 1934 and ran until 1972. There are two connected London underground stations under the Victoria station. The new Victoria line was started in 1969.